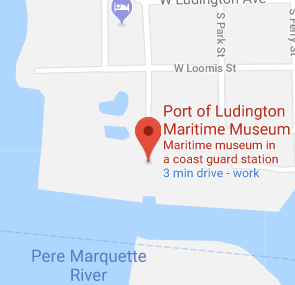 The Port of Ludington Maritime Museum brings history to life with digital storytelling, authentic images and artifacts, and engaging interactive exhibits that entertain, enlighten, and inspire a deeper appreciation for the region’s maritime history. Located in the former U.S. Coast Guard Station, now listed on the National Register of Historic Places, this family-friendly, three-story museum overlooks Lake Michigan’s wild shoreline, Ludington’s iconic North Pier Light, and the historic carferry Badger, extending the maritime experience beyond its doors in this vacation wonderland. The museum is operated by the Mason County Historical Society, which also operates the nearby Historic White Pine Village. Learn more by clicking the membership button below or donate using the donation button! Visit both The Port of Ludington Maritime Museum and Historic White Pine Village with dual ticketing: Two Museums for one great price! Vehicles can parallel park along South Lakeshore Dr. or in the Loomis Street Boat Ramp parking area. Busses will not fit through the turn around in front of the museum. Busses should drop-off their groups at the Loomis Street Boat Ramp parking area. There is a connecting sidewalk located in the southeast corner of the parking lot.